Temple Square has long been one of Salt Lake City’s most popular tourist attractions. As members of the Church of Jesus Christ of Latter-Day Saints (Mormons) have become prominent in politics, entertainment, sports and even on Broadway, this attraction is more interesting and relevant than ever. It’s not only a religious site. It’s an integral part of the history and culture of Salt Lake City. I live near Salt Lake City and I am LDS. I have visited Temple Square many times. It’s a beautiful and peaceful place to spend an hour or more in downtown Salt Lake City. Everyone, regardless of faith, is welcome at Temple Square. Temple Square is open daily from 9 a.m. to 9 p.m. Admission is free and families are welcome. Casual attire is the norm for visitors, though “Sunday dress” is requested for ticketed concerts and special events. Taking a tour with the missionaries is the best way to learn about Temple Square and the LDS Church, but you can explore the grounds and visitors centers on your own if you prefer. When you arrive, expect a friendly greeting and a few questions like, “Where are you from?” or “What brings you here?” When the missionaries ask if you’d like a tour, a friendly “No, thank you.” should do the trick if you’d rather explore solo. Missionaries can be found throughout the grounds and they will be happy to answer any questions you have about Temple Square or the Church of Jesus Christ of Latter-Day Saints. Really, ask them anything. They won’t be offended by any sincere question. The young missionaries come from all over the world and speak many languages to accommodate international visitors to Temple Square. The flags of the missionaries’ home nations are displayed under their name tags. They are unpaid, full-time volunteers who serve for eighteen months and then return home to normal life. The temple is not open to the general public. Temples are sacred places of worship in the LDS Church and are only open to members in good standing. There is a replica of the Salt Lake Temple in the South Visitors Center where visitors can see what the inside of the temple looks like. Members of the LDS Church believe that couples can be married for eternity inside LDS temples, and many locals choose to marry in the Salt Lake Temple. For an interesting cultural experience, visit Temple Square on a Friday or Saturday in June and watch the happy couples exit the temple one after the other to a crowd of cheering family and friends. Brides and grooms can be found with their photographers all over the temple grounds on a busy wedding day. I hear that Valentine’s Day is popular for proposals on Temple Square and I’m sure that’s fun to watch too. The Tabernacle is the home of the world-famous Mormon Tabernacle Choir and visitors can see the choir practice on Thursdays at 8:00 p.m. or attend the live broadcast of Music and the Spoken Word, the longest running network program in the country, at 9:30 a.m. each Sunday. Organ recitals are performed daily at noon or 2 p.m. in the Tabernacle. Two visitors centers can be found on Temple Square. 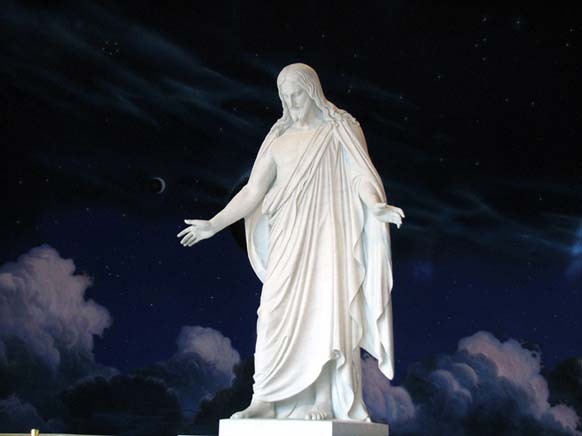 The North Visitors Center is larger and has three floors of interactive exhibits explaining Latter-Day Saints’ beliefs about Jesus Christ, families, the Bible and the Book of Mormon. The South Visitors Center features exhibits on the temple and several interactive video presentations. The gardens on the grounds of Temple Square are meticulously kept through the efforts of a full-time staff and volunteers. Seasonal plants and flowers are always abundant on and around Temple Square. From Thanksgiving through New Year’s Day, Temple Square is decorated with millions of Christmas lights and a life-sized Nativity scene outside the Tabernacle. Our family enjoys visiting Temple Square. Seeing the Christmas lights is an annual tradition for us and Temple Square is always a lovely and peaceful place to visit when we come to downtown Salt Lake City. Lindo este blog! parabéns por escolherem ser uma família de Santos dos Últimos dias! I visited the Temple this past Saturday with my family and found this overview quite accurate. We spent about 45-50 minutes wandering the visitor centers and grounds. It’s a beautiful setting and interesting historically and architecturally- very clean too! I’m not Mormon (nor open to becoming one) but the staff was helpful and not pushy at all.